Would you like a little comedy with that whine? Is this too good to be true? Did American luger Kate Hansen really record video of a wolf lurking outside her door at the Sochi Olympics? Indeed, it’s a fake. But you know that a hashtag and a Twitter feed are officially an Internet phenomenon when they inspire a Jimmy Kimmel video hoax (he also brought us the flaming twerker video as you may recall). Not that there was much doubt that #sochiproblems and @sochiproblems have been resonating with a large audience during this winter Olympics. At the midpoint of the games @sochiproblems has more than 400,000 followers and is growing daily. The official @sochiOlympics feed has only 34,400. The fake wolf video had a million views on YouTube this afternoon and is about to break the 1.5 million mark a few hours later. Journalists whining about their working conditions can draw an audience, as long as the posts are funny. And they are. Reporters’ complaints bloomed into prominence with a Feb. 4 washingtonpost.com blog post that showed the hilarious and gross hotel experiences visiting journalists were live Tweeting as they arrived to cover the games. 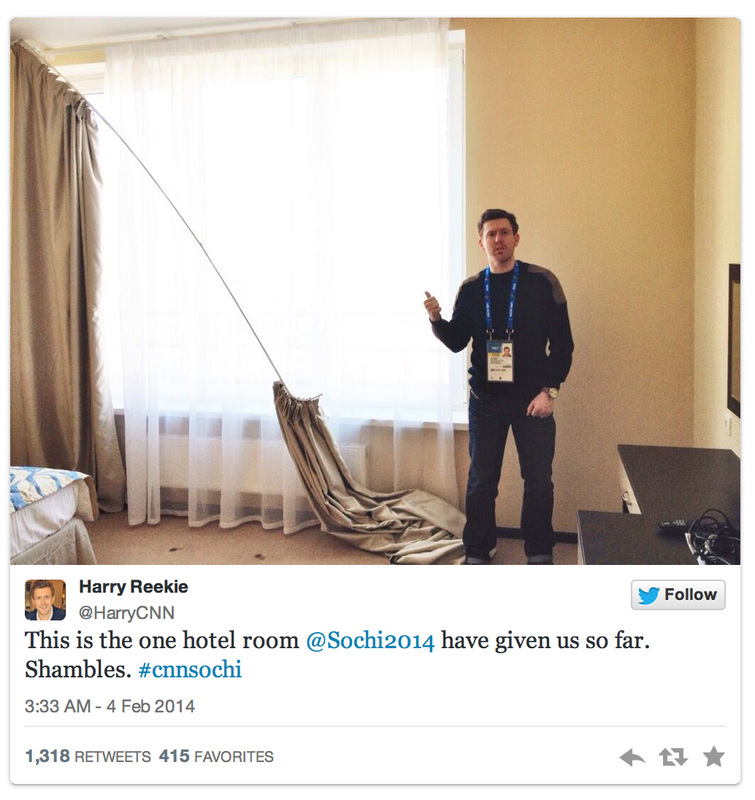 CNN reporter Harry Reekie’s hotel room in Sochi. The washingtonpost.com Sochi problems blog was the “Post Most” top story for more than 24 hours. A “survival doctor” capitalized on the conditions (and attentive audience) by recommending to athletes that they don’t drink the water. Or pet the dogs. 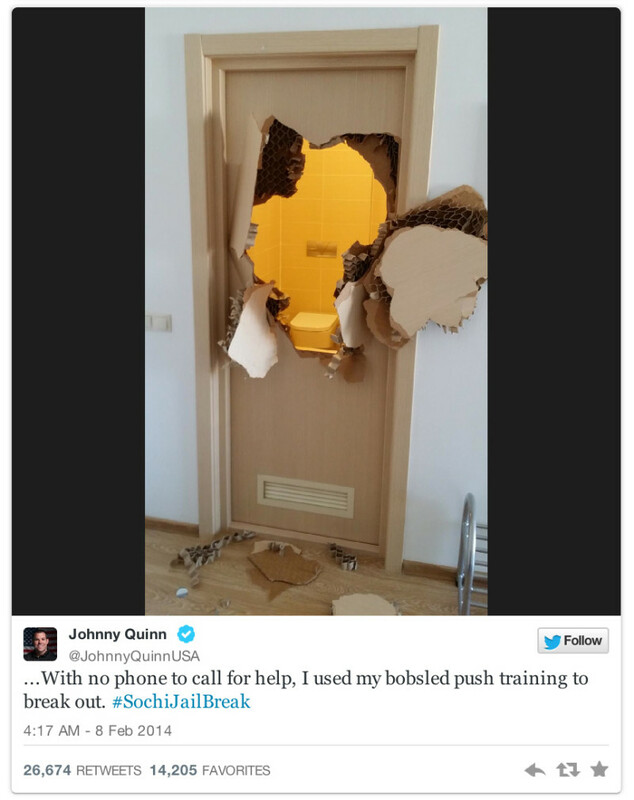 U.S. bobsledder Johnny Quinn took a pro-active approach when his door lock jammed. He escaped by literally running through the door, prompting more giggles, a lot of shares and a story on Yahoo! sports. Not surprisingly, he was once a wide receiver on the Green Bay Packers practice squad. There can be an upside to flimsy construction materials. 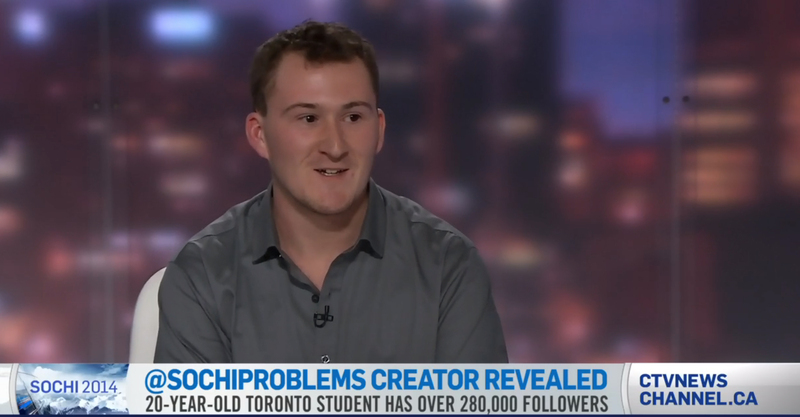 The @sochiproblems Twitter feed is curated by a Alex Broad, 20-year-old student from Toronto. People can Tweet directly at the account and Broad also farms posts from a variety of Sochi-related hashtags. He told CTV news that he was working hard to sustain his audience by contributing positive and funny Tweets, and avoiding the outright whining. Alex Broad told CTV that he tries to keep the @sochiproblems post upbeat. Still, the Russian hosts in Sochi were not amused. But what can you do to compete against Tweets like this from St. Paul Pioneer Press reporter Brian Murphy?